There are many models for doing meaningful work. 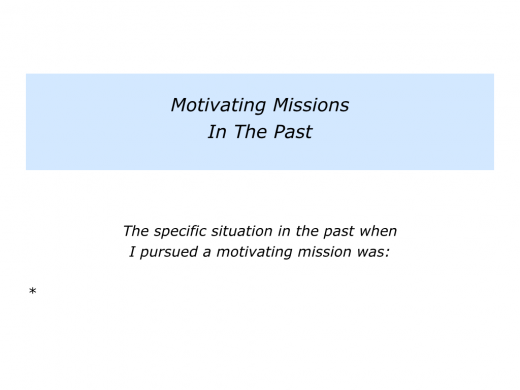 One approach is to pursue a motivating mission. Charles Garfield, the author of Peak Performers, described how many great workers are driven by a sense of mission. A clinical professor of psychology, he also worked as the leader of a team of engineers, scientists and support staff on the Apollo 11 project. “One peak performer after another spoke of self-training, learning by experience, organising that experience around a single theme, speaking and finding a purpose, a personal mission that represents something important. “They want to feel proud of themselves, to achieve something, to leave a mark and a contribution, and they follow their plans for doing all that purposefully and tenaciously. 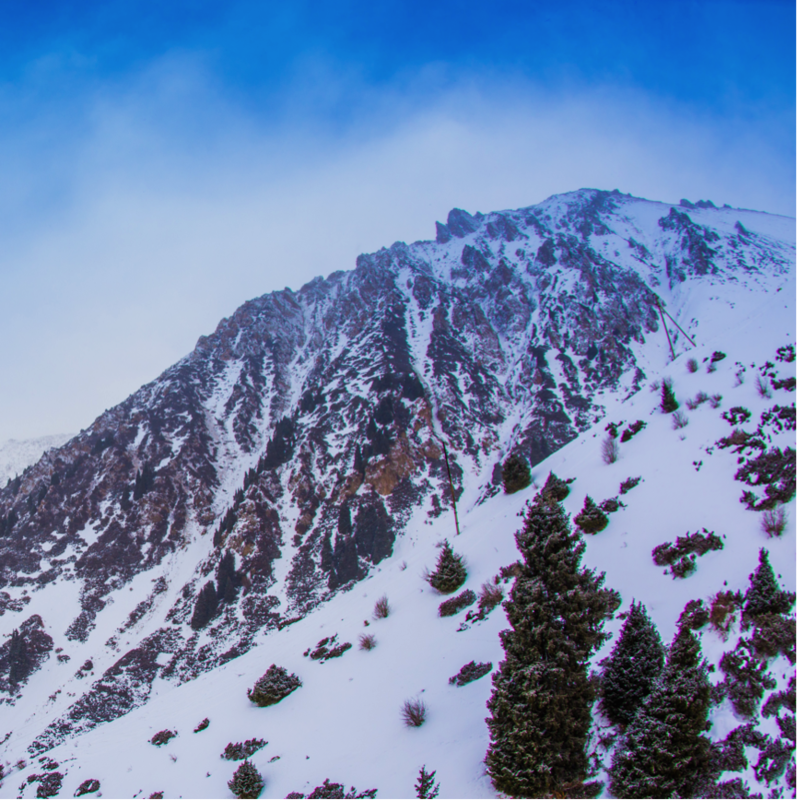 “Peak performers are not merely exceptions. They represent a kind of person any of us can be – once we find the capacity in ourselves. 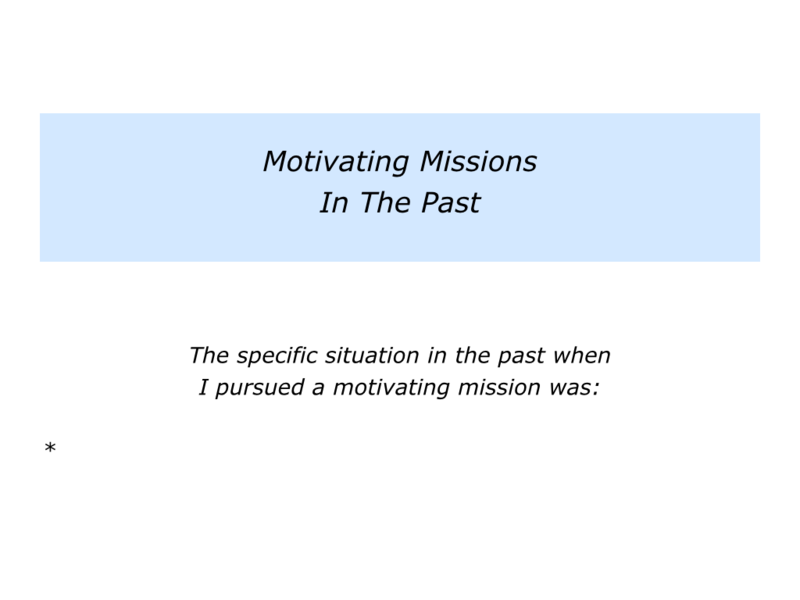 Looking at your own life, when have you pursued a motivating mission? You may have aimed to help other people, create something beautiful, lead a team, achieve a prize or whatever. If you wish, try tackling the exercise on this theme. This invites you to describe when you have pursued such a mission in your personal or professional life. It then asks you to do the following things. 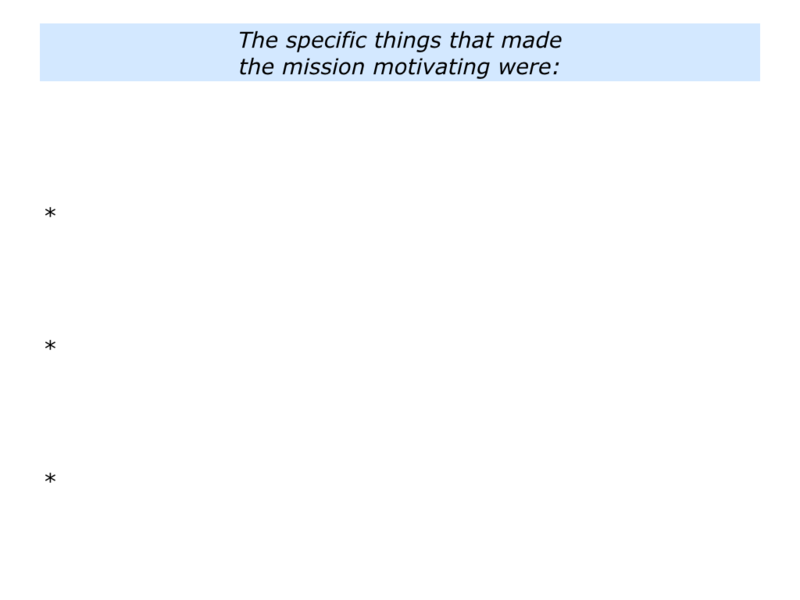 Describe the specific things that made the mission motivating. 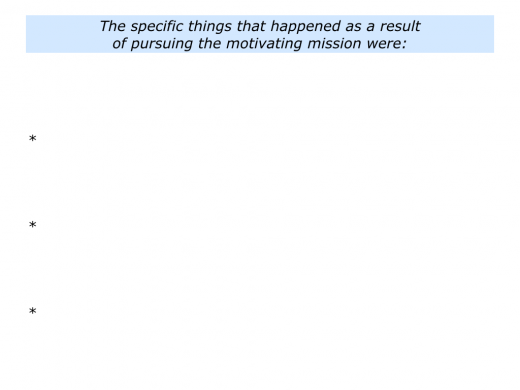 Describe the specific things you did to pursue the mission. 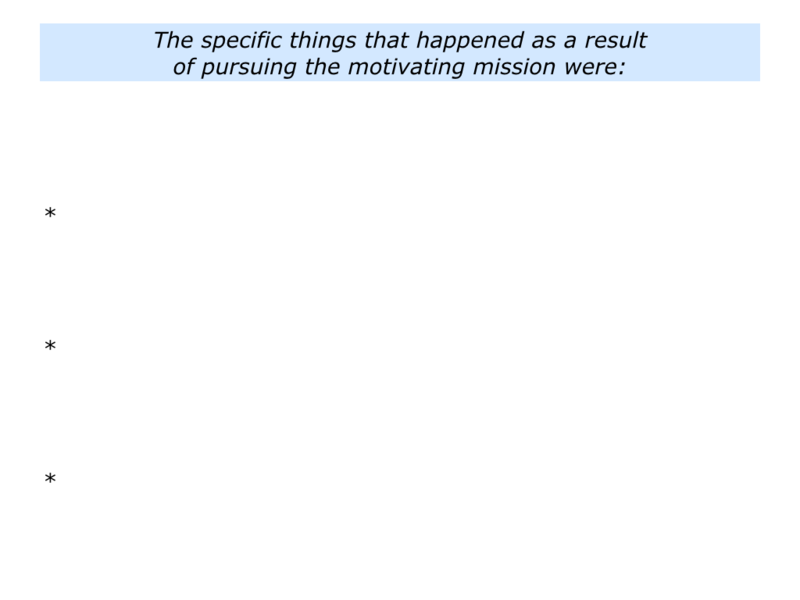 Describe the specific things that happened as a result of pursuing the mission. How to find missions that are motivating? People sometimes do this in their personal lives by focusing on the things they find meaningful and magical. They love to encourage their children, spend time with friends, visit new countries, redesign their houses, do stimulating projects or whatever. Doing such things gives them positive energy. 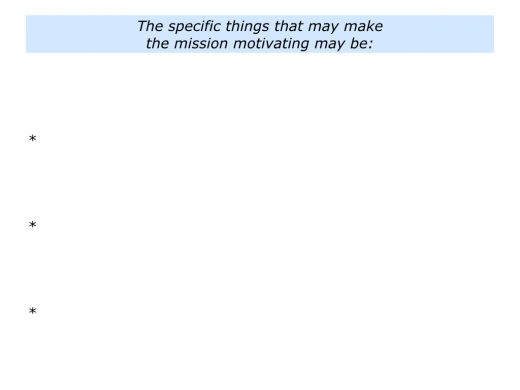 What about finding motivating missions in work? Many employers seek the Holy Grail. They want their people to be fully engaged and align their energies towards achieving a specific goal. During the 1980s authors such as Charles Garfield, Warren Bennis and Tom Peters published books on leadership. Virtually all underlined the need for leaders to communicate a compelling vision. Many leaders then went on courses where they learned how to communicate enthusiasm to their people. That was fine, but then reality began to bite. Employees work best when they believe in the mission. There is a limit to what extent people can feel motivated by selling unnecessary products or increasing shareholder value. 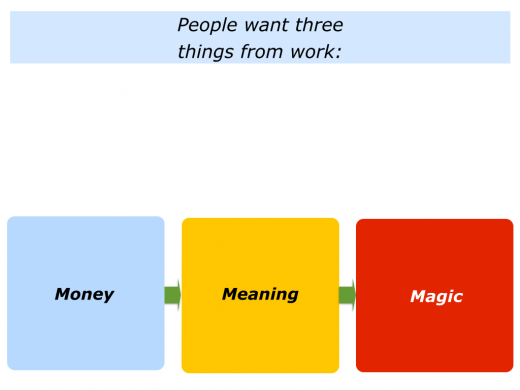 People often want three things from work: money, meaning and magic. Money feeds the stomach. But meaning and magic feed the spirit and the soul. Looking at your own work, you may well feel more motivated when you believe in the reasons for pursuing a particular project. Sometimes it also helps if there is a touch of magic. This helps to feel alive. Looking to the future, are there any motivating missions you would like to pursue? You may want to write a book, nurture a garden, create a website, start a support group, pass on knowledge that helps other people or whatever. What will be the benefits of making it happen? If you wish, try tackling the exercise on this theme. 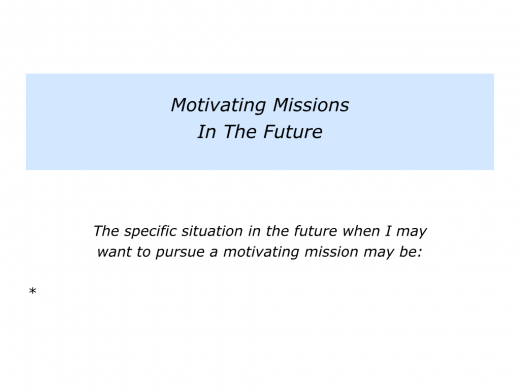 Looking to the future, this invites you to describe a motivating mission you may want to pursue in your personal or professional life. It then asks you to do the following things. 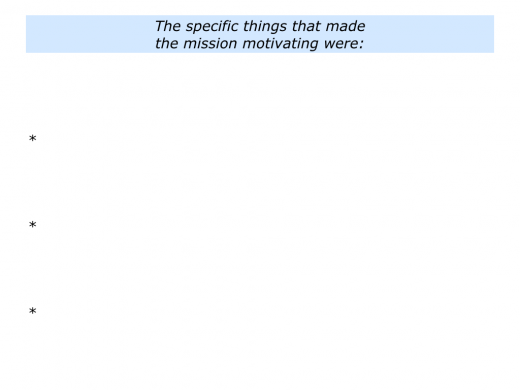 Describe the specific things that will make the mission motivating. 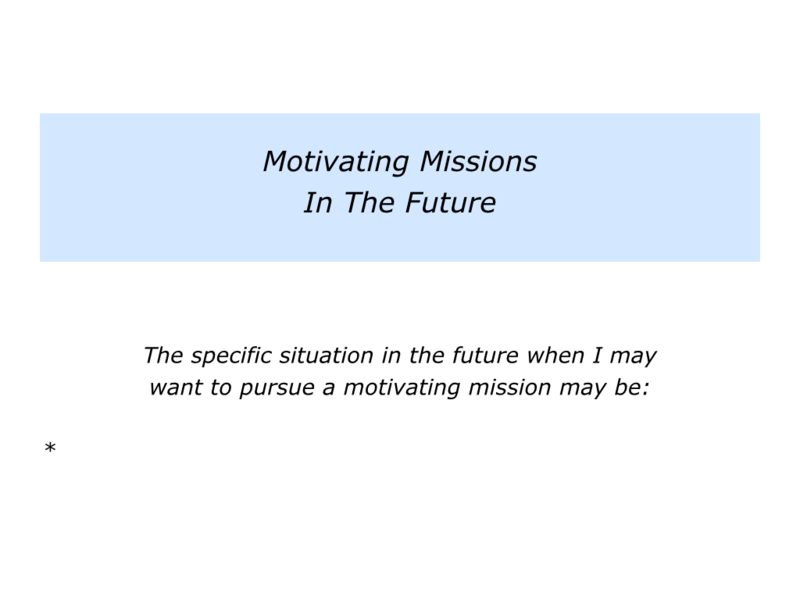 Describe the specific things you can do to pursue the mission. 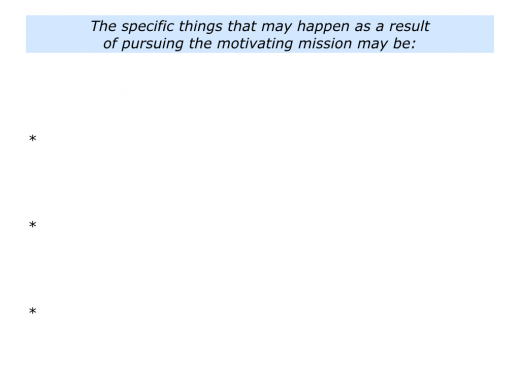 Describe the specific things that may happen as a result of pursuing the mission.